The model HS2022 becomes one of the most sensitive small radius IRMS, and incorporates many high level design features. All stainless steel and metal gasket construction flight tube for ultra-high vacuum purity to ensure minimal backgrounds and zero water contamination. True differential pumping for superior ion transfer through the flight tube from the high sensitivity source to the large dynamic range collectors. 120° extended geometry with an 11cm radius magnetic sector giving an effective 21cm radius dispersion and double direction focusing. Additional high dispersion long spur with 98.8° sector which creates a distance of 24cm between the focal points for m/z 2 and 3. This leads to an abundance sensitivity at m/z 3 of <1 ppm which eliminates helium ‘tailing’ in to the D/H collector. Truly universal Faraday triple collectors for simultaneous collection of adjacent masses in the range 28,29,30 – 64,65,66 with no adjustment of collectors or amplifiers. Additional single Faraday collector and high gain amplifier for m/z 3 on the hydrogen spur. The desired combination of the 4 collectors is selected through the software. Software switchable variable gain amplifiers and 50V amplifier outputs are available as options. Asymmetric extended geometry to give true stigmatic focusing with twice the dispersion of normal geometry with the same radius sector. Shorter path length than traditional extended geometry to decrease ion/molecule interactions and so ensure 100% transmission through the analyser and a sensitivity which is in continuous flow mode <850 molecules/ion for CO2. True differential pumping by turbo-molecular pumps with a high compression ratio for both He and H2, to remove the detrimental effect of abundance sensitivity during continuous flow applications and eliminate memory. 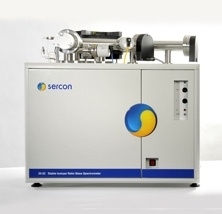 With a mass range covering 2 to 96 AMU it is suitable for the analysis of light stable isotopes in all the commonly measured gases; H2, N2, NO, N2O, O2, CO, CO2, SO and SO2. Triple port reference gas injection system. Suitable for calibrating each sample, using a reference gas instead of an internal standard and for easy tuning of the mass spectrometer. Size, type and positioning of reference gas pulses are under software control. Data acquisition system uses state of the art highly stable and linear high frequency converters which produce integral slices with zero dead time and quantisation below the beam statistical noise floor at all signal level. To Request more information on this product please contact our sales department on +61 3 9899 6100.